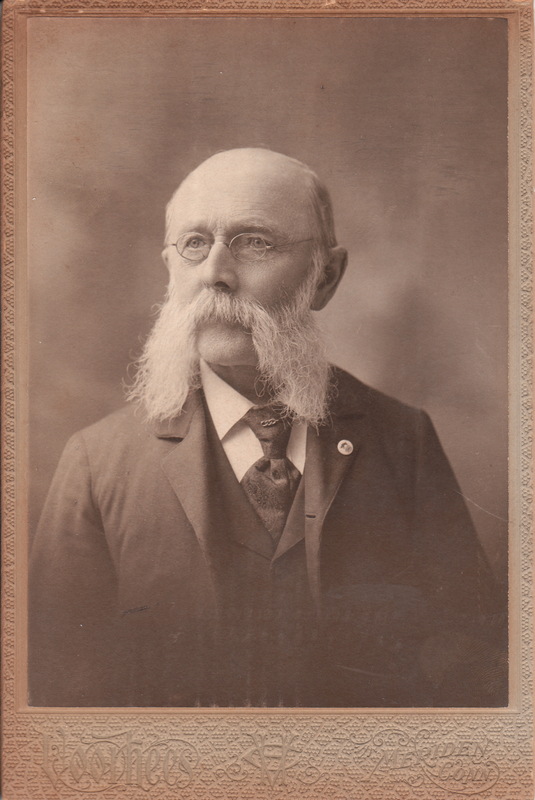 This cabinet card is a portrait of an older bespectacled gentleman with a significant mustache. He is well dressed and is wearing a pin on his lapel. The top of the pin seems to have a figure that looks like a buffalo or bucking bull. The print on the bottom of the pin is illegible. Hopefully, a visitor to this site will be able to provide more details about the lapel pin. The photographer of this image was H. C. Voorhees of Meriden, Connecticut. Voorhees liked to write instructional articles appearing in the era’s photographic journals. Among his articles were publications in Wilson’s Photographic Magazine (1891) and Photographic Mosaics (1896). To view other interesting photographs of remarkable mustaches, click on Cabinet Card Gallery’s category of “Mustaches (Only the Best). The lapel pin is less clear — a bison over a crown, maybe? Presumably a member of IOOF Pacific Lodge No. 87 in Meriden. I think the lapel pin is also an IOOF emblem, the three chain links with a rampant buffalo (?) over it, like this. And underneath, an all-seeing eye, like this.